I suspect at least people who remember Hale-Bopp or other big 20th century comets will be disappointed. Pretty much any comet would be disappointing compared to Hale-Bopp. It was very nearly the perfect comet: very bright, two very distinct obvious tails, and extremely long-lived as a naked-eye object. ISON is of a totally different character than great comets like Hale-Bopp or McNaught. It is a sungrazer, with much smaller nucleus size, but much closer perihelion distance. So the best show happens when it is so close to the sun that we can't see it visually. * When it is far enough from the sun to be visible in the night or even twilight sky, it is much fainter and less impressive than those other comets were under the same viewing conditions. You can see this by comparing their magnitude-elongation curves. Although ISON isn't a great comet by visual observing standards, it is a great comet as far as sungrazers go -- rarely are sungrazers this big, or this well observed by space-based telescopes. It will be really interesting to see what happens in the hours and days ahead, and it could still put on a good show for observers if/when it reappears in early December. *And actually there is a small chance ISON could be bright enough to be visible to the eye right at or shortly after perihelion, but do NOT try it unless you really know what you're doing. Attempting to view objects this close to the sun is seriously dangerous without proper precautions. The trouble is that ISON has been advertised as the comet of the century. I suppose if a comet has a big nucleus AND a high level of outgassing AND is a sungrazer, you will get something really spectacular. But ISON might only score one out of three. Which of course has been hard to know. The hopes for high outgassing seem have been too high, perhaps based on that this seems to be a fresh comet never before been in the inner solar system, so it could be very volatile. It will be interesting to see how it will appear after perihelion nevertheless. If it breaks up, that would increase the surface area and evaporation. The trouble is that ISON has been advertised as the comet of the century. By ignorant sensationalists in the media, not by the scientists studying it. ISON's 'comet of the century' expectations were a lot more realistic last year, when the predicted light curve brought it up past -12th magnitude, or about the brightness of the full moon. That would have been awesome if that panned out, but what we're getting is still really, really good. It's already brightened several magnitudes in just the last few hours, and we might get up to -5 or so. And then I think a lot of people read that -12th magnitude prediction and actually thought that meant we could see a comet the brightness of the full moon in the night sky. Absolutely no. Going to sleep; tomorrow's going to be fun. 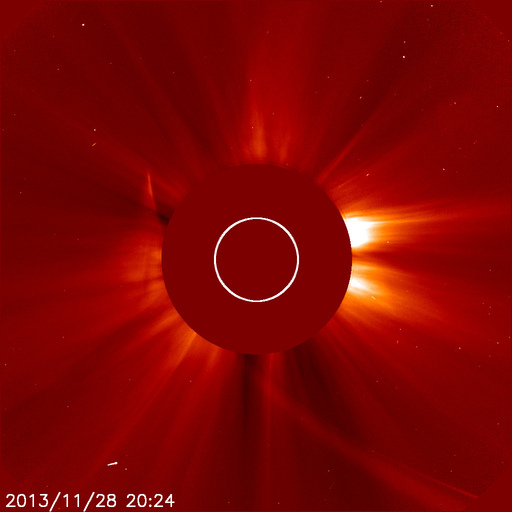 ISON should be entering the LASCO C2 field of view in a couple more hours. Also I'm gonna predict right now that it will survive perihelion. If I'm right, awesome! And if not, awesome! It's already brightened several magnitudes in just the last few hours, and we might get up to -5 or so. That will put it close to McNaught, but a -5 only at perihelion and less than a degree from the sun will not earn it much fame unless it had coincided with a total solar eclipse (how cool would that have been). Also I'm gonna predict right now that it will survive perihelion. It's hot there, but a several km wide lump of ice, dust and rocks isn't that easily evaporated. Perihelion right now. Looks like the nucleus may have disintegrated on the way in. We'll know for sure soon. Disintegrated as in disappeared or survived and broken up as Lovejoy? EDIT: Lovejoy didn't break up, did it? Anyway, since it's within the Roche limit, it's not surprising if it breaks up, but if Lovejoy could survive the corona, surely ISON will make it through in one or several pieces? To soon to tell, but it seems to have disappeared entirely. As it came in the coma faded significantly and kind of smeared out along the path. SDO didn't see anything along the expected track, but that doesn't necessarily mean nothing at all is left. We'll have to see if SOHO sees anything come around the other side. It might require image enhancement. Yep, BBC reporting that there is no sign of ISON. *sigh* and I was anticipating it so much. Nothing is apparent coming around the expected outbound trajectory, so it seems ISON is indeed gone. There was an earlier clue to this in that the comet grew a second bright thin dust tail as it approached. Some thought this was the gas tail, but a gas tail would point directly away from the sun. Instead it is a tail of larger particles, less affected by radiation pressure and so it almost perfectly traces the orbital path, unlike the larger diffuse tail which is slowly pushed away. This new tail of larger particles grew very intense in conjunction with the coma brightening, suggesting the nucleus was in the process of disintegrating. Then the coma rapidly faded and smeared out, and it seems nothing substantial remains of ISON. Something did survive, I think. I didn't expect much but a bit more than this. But nothing very impressive. Perhaps the nucleus was pretty small, or it's quite rocky not venting so much, certainly not anymore. Oh neat, I hadn't waited long enough to see that imagery. Looks like leftovers of the debris stream, the nucleus itself is probably completely disrupted. Definitely not going to be any show for us come December at any rate. :/ The show was all in the approach! I really did not expect that it would break apart so quickly and hours before perihelion, but of course that's par for the course. Comets are really unpredictable buggers! Hopefully in the next days or weeks we will learn some neat things through the observations and data processing.